Are you looking for a hard-working midsize pickup truck? Armed with a rugged design and a strong foundation, the 2020 Toyota Tacoma will fit the bill with powerful, fuel-efficient engine options, a strong towing capacity and innovative technology at every turn. 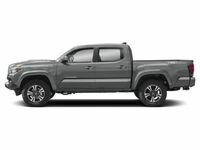 Tailor-made for work or play, the Toyota Tacoma promises to stand out in this 2020 Toyota Tacoma vs 2019 Honda Ridgeline comparison. The 2020 Toyota Tacoma will cater to any and all drivers with a choice of six grades – Tacoma SR, SR5, TRD Sport, TRD Off-Road, Limited and the trail-rated TRD Pro – that can be tailored to fit your needs. 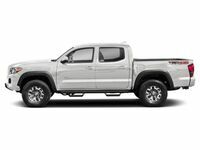 Toyota Tacoma entries feature Access and Double Cab platforms that can be paired with a 6.1-foot standard bed and a 5-foot short bed. With room for five passengers, the 2020 Toyota Tacoma functions as a hard-working pickup truck and a capable family hauler. What Are the Differences Between the Toyota Tacoma and Honda Ridgeline? A world-class entry in the midsize pickup truck segment, the Toyota Tacoma is a fan favorite in this 2020 Toyota Tacoma vs 2019 Honda Ridgeline comparison. Armed with an impressive list of features, the Toyota Tacoma is well-equipped for any scenario. Base Toyota Tacoma SR entries come standard with 16-inch steel wheels, heated power side mirrors, trim-specific grille designs, an LED bedlamp, a rearview camera and a 7-inch touchscreen Toyota Entune™ 3.0 infotainment system with access to Apple CarPlay, Android Auto, Amazon Alexa and Bluetooth. Toyota Safety Sense™ is a standard fixture on the Toyota Tacoma spec sheet and will add a Pre-Collision System with Pedestrian Detection, Lane Departure Alert with a Sway Warning System, Automatic High Beams and Dynamic Radar Cruise Control to upgrade safety. To further upgrade your drive, the 2020 Toyota Tacoma will add 18-inch alloy wheels, a Panoramic View Monitor, LED headlights, premium leather upholstery, a Multi-Terrain Select System, a Multi-Terrain Monitor, a power moonroof and much more. Power and performance are hallmarks of the 2020 Toyota Tacoma design that will rival the 2019 Honda Ridgeline. Entry-level Toyota Tacoma trims employ a 159-horsepower 2.7-liter four-cylinder engine that is paired with a six-speed automatic transmission to earn 23 mpg on the highway. To upgrade power and performance, the Toyota Tacoma employs a 278-horsepower 3.5-liter V-6 engine that is mated to a six-speed automatic gearbox to make 24 mpg on the highway. When properly equipped, the Tacoma will tow up to 6,800 pounds of cargo – 1,800 pounds more than the Honda Ridgeline. The Honda Ridgeline is powered by a 280-horsepower 3.5-liter V-6 that is married to a six-speed automatic transmission. Visit Downeast Toyota today to get behind the wheel of a 2020 Toyota Tacoma!